Every Copeman Hart instrument is bespoke with each customer having an unbelievable number of options to consider, from the number of manuals and speaking stops, through to the placement of the speaker system, to the choice of colour and minutiae of console design. Whatever the options chosen, these are high-end elegant instruments with luxury drawstop consoles and wood-based keyboards; essentially they are nothing but the best to help you enhance your playing and congregational singing. Founded in 1960, Copeman Hart enjoys an international reputation for producing not only the most pipe-like sounds, but the most comfortable and authentic consoles. Copeman Hart produces custom built organs and nothing else. Our approach to organ building has always been more akin to that of the traditional organ builder as all organs are individually designed and custom-built to traditional pipe organ standards, using many pipe organ components. Consoles are built to match the type and colour of timber in the client’s building, and are superior to many pipe organ consoles. Our long association with, and research into, digital systems, coupled with our use of the most advanced hardware, means that the software and data that we have developed from within our own resources gives results which are superior to cheaper instruments. The philosophy of the company has always been to make the best imitation of the pipe organ. Whilst acknowledging the superiority of a good pipe organ, it is a sad fact that some churches just cannot afford the many tens or hundreds of thousands of pounds sometimes necessary to install or restore a good pipe organ. There is, therefore, an established need for electronic organs at which organists feel at home, and which make convincing pipelike sounds. Our organ consultants have an unrivalled in-depth knowledge of our instruments, and church organs in general, allowing our customers to be guided through the plethora of questions and options with ease. From a detailed blueprint for the desired instrument, a comprehensive price with a wide range of options is developed for the customer to consider. This approach is similar to that taken by pipe organ builders and is unique to digital organs. Some may say this is an old fashioned approach whilst others realise that this tradition is one of the major reasons why Copeman Hart is regarded by many to be the partner to work with when building the ‘King of Instruments’. 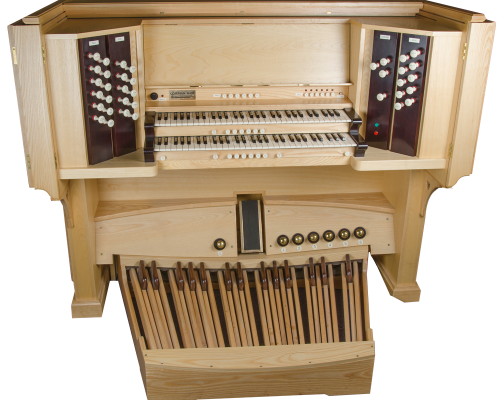 When you buy a Copeman Hart organ, you are making a capital investment in every sense, and the organ becomes an increasing asset. Since its inception, Macquarie University had hoped to have a fine organ. Copeman Hart made it possible. We’re proud and delighted . . . and very impressed with the way in which Copeman Hart installed and voiced this superb instrument. It will make a tremendous difference to the musical and ceremonial life of the campus, and will give a lot of joy to Sydney music lovers. After playing various different instruments we were totally convinced that Copeman Hart was by far the most authentic in terms of the overall sound and the comfort of the console. We are naturally delighted with the end result, which has given us an organ capable of providing a variety of colours, and powerful enough for large services. The organ is very comfortable to play and provides many opportunities in terms of organ voluntaries. The unbelievably authentic organ sounds, coupled with the superb and beautiful voicing of its stops. They are of the highest tonal quality when compared with other digital electronic organs that I have presided at. To me, it sounds like the real thing without the pipes. Copeman Hart – I applaud you! When we invited you to create an organ for our parish church, near Burnley in Lancashire, we knew that we would get a superb instrument, because so many leading British organists, including the president of the Royal College of Organists, had told us that you are the best in the business.But we little thought that our new Copeman Hart organ would prove to be one of the very finest church organs in the diocese of Blackburn. Every stop has its own personality - this is an organ of real character, equal to the best of pipe organs. Every stop, whether played singly or in combination, makes real music to delight the ear and to uplift the soul. At the dedication service last Sunday our congregation was swept away by its grandeur and beauty. No words of praise are too high for what you have done for us. With your usual patience and expertise you managed to give us a splendid sound which suited all our demands, and for that we are truly grateful. Many visitors to the Chapel remarked that they were pleased that the pipe organ was back in service, when actually they were hearing the Copeman Hart.